Bertuzzi Food Processing S.r.l. is active since 1936 in the design and manufacturing of equipment and plants for fruits and vegetables processing for the production of juices, concentrates, puree, basis for yoghurt, baby food, jam, tomato paste and sauces etc. Bertuzzi is engaged in the continuous development of equipments in order to better satisfy the most stringent requirements in terms of quality and yield. Improvement of the pomegranate processing for the production of cloud y and clear concentrates and NFC. Improvements have concerned the arils extraction system (more efficiency in recovery and less contamination by skin), the juice extraction system carried out by a dedicated press. Improvement of the citrus juice extractors for the production of high quality NFC juice, pasteurized at low temperature to maintain intact the organolectic characteristics. The design of the extractor has further developed by our R&D Dept. in order to maximize the quality of the juice and to increase the speed of operation. 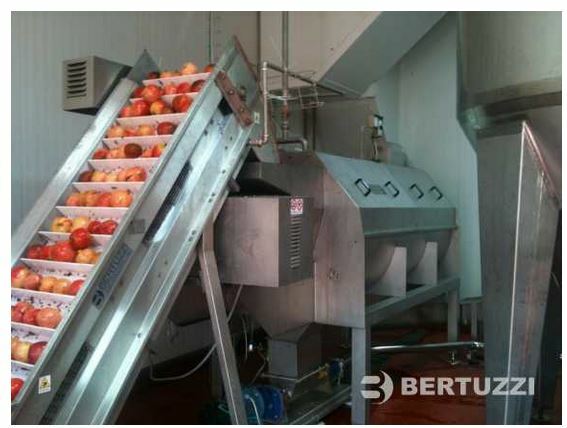 Development of cold extraction system for apples, pears and other fruits in order to achieve a better quality puree free from residues of agrochemicals and skin color. The cold extraction system can be also coupled with inert gas protection in the whole process of extraction in order to decrease the risk of oxidation even decreasing the consumption of expensive chemicals used as antioxidants. Development of state of the art sauces production lines both continuous and batch type. Bertuzzi has recently successfully commissioned a very large (13 t/h) ketchup and sauces plant in Russia. Development of lines for extruded products about snacks, breakfast cereals, baby food and instant and functional ingredients. Improvement of the juice and milk UHT recombination process technology. Bertuzzi Food Processing S.r.l. has been gaining a wide experience in Iran by supplying several complete plants and equipment to process fruits like pomegranate, citrus, stone fruits etc and is very glad to be back in this Country. 28/04/2017 in English, Preserving. Tag:baby food, basis for yoghurt, Bertuzzi, concentrates, jam, plants for fruits and vegetables processing, plants for fruits and vegetables processing for the production of juices, puree, tomato paste and sauces etc.